Two police officers suffered non-life-threatening gunshot wounds in a confrontation with the man at the church's facility in Inglewood, authorities said. 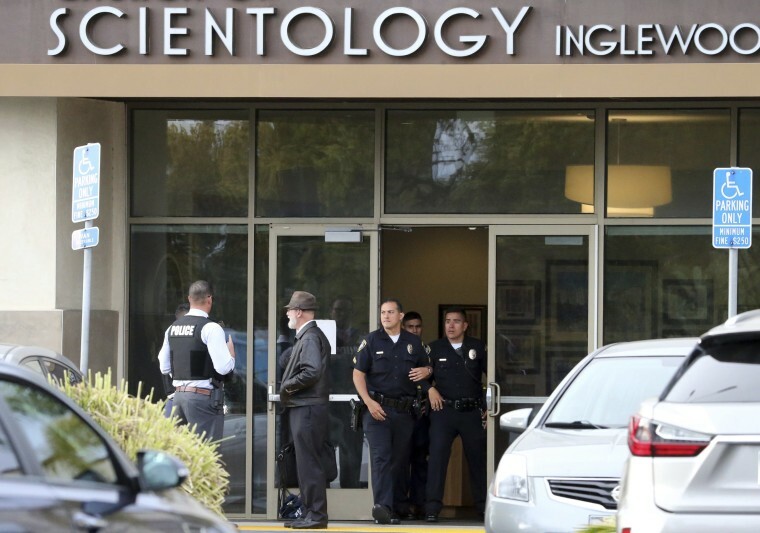 LOS ANGELES — A sword-wielding man who arrived in a luxury car was fatally shot at a Scientology church building on Wednesday, said police, who said two officers suffered non-life-threatening gunshot wounds. Many details remained unclear about the incident at the Church of Scientology of Inglewood, near Los Angeles, including whether the suspect had a gun and whether he shot the officers. Police said the officers, neither of whom was immediately identified, were shot in the hand and arm and were being treated at a hospital. Inglewood police said they responded to a call that a man was inside the church with a sword Wednesday afternoon. They said the man, who arrived in a white Bentley that could be seen parked outside the church building, was shot in the head and later died. No one else was injured, police said, and no information about the suspect was immediately available beyond that he was a man. The church said it was cooperating with the investigation. Swords have symbolic significance in the history of Scientology. The church's most important document, "Dianetics: The Modern Science of Mental Health," grew out of an unpublished book titled "Excalibur," written in 1938 by the church's founder, L. Ron Hubbard. In the Arthurian legends, Excalibur is the name of the sword that only Arthur can wield as the divinely appointed king of the Britons. In 2008, Mario Majorski, a former church member, was shot and killed by security guards after he drove on to the grounds of the church's facility in Hollywood carrying two swords. The church said Majorski had made numerous threatening phone calls to Scientology offices in Oregon and California. The Inglewood facility is about 10 miles south of the famous Scientology Celebrity Centre in downtown Los Angeles, which caters to performers, politicians, athletes and other notable church members.